The offensive backfield is the area of an American football field behind the line of scrimmage. The offensive backfield can also refer to members of offense who begin plays behind the line, typically including any backs on the field, such as the quarterback, halfbacks and fullback. Most running plays begin with a hand-off in the offensive backfield. All kicks and punts must take place in the offensive backfield. If the offensive ball-carrier is tackled in the backfield, the team will lose yards, in that the distance they need to attain for a first down is more than at the beginning of the play. There are many rules which differ for play in the offensive backfield as opposed to play in front of the line of scrimmage. The 1906 football rule reforms mandated that the offensive team line up with at least seven players on the line of scrimmage, which are now commonly called "lineman". Therefore, a maximum of four players are allowed in the offensive backfield. The other players not on the line of scrimmage may be positioned anywhere, but all must be at least 1 yard behind the seven or more players on the line of scrimmage. A forward pass can only be legally made from the offensive backfield. The modernization of the roles of lineman and backs is often traced to Amos Alonzo Stagg. 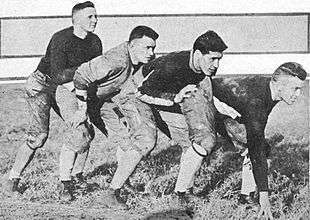 Some of the greatest backfields in the history of college football include those of the 1912 Carlisle Indians, 1917 Georgia Tech Golden Tornado, 1924 Notre Dame Fighting Irish, and 1945 Army Cadets. Joe Guyon was a member of both the aforementioned Carlisle and Georgia Tech teams. Typically, quarterbacks or halfbacks passed the ball, and fullbacks handled kicking duties. ↑ "NFL Rules Digest: Positioning of Players at Snap". ↑ Edwin Pope. Football's Greatest Coaches. pp. 231–232.